Information: Length - 5 3/4" - 146mm. Listed as a Porsche 963 in the 1988 catalogue. Car Category Details: A car racing class concentrating on the ability of manufacturers to build reliable yet sporty cars. Make Details: The most famous sports car maker in the world. 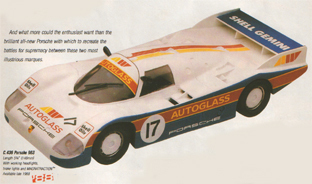 Model Details: The 962 was a sports prototype race car which was competitive over many years. Red Various shades of red.